Pads are 36" x 10"
Can temporary stair tread protectors be re-used multiple times, or are they one-time only? What adhesive is used- need to be sure no harm to polyurethane finish on hardwood stairs. 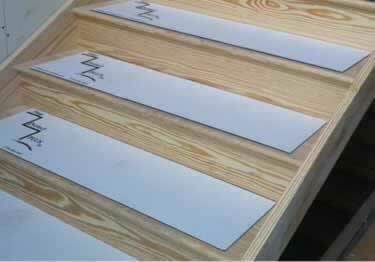 36" x 10" Stair Tread Protection Pads have an adhesive backing to keep them in place and are great for protecting hardwood stairs. Re-usable soft surface protection mat that keeps floors and counters safe from damage and debris during construction.